Hi, friends. Today we have a fun nerd puzzle that should be a real treat for us to work on together! I recently upgraded to a 1Gbit/1Gbit connection with AT&T (thx Google), and I've been putting it through its paces as I upgrade my network to handle 1Gbit WAN-to-LAN performance. Now let me show you the performance across four different speed tests performed on freshly-installed browsers/tools. 152Mbit WAN-to-LAN? What the fuuuuudge? All of these results are repeatable. As many times as I want to click the "test" button, I can get similar performance results out of these browsers. So What the hell is Chrome doing? And why? And how can we fix it? No extra proxy settings in Chrome anywhere? What do the CPU/RAM utilizations look like during the different tests? TCP Offload is definitely turned on? Is there disk activity during the Chrome test that would indicate an issue with the RAMDisk caching during the test? MTU is set right/consistently in the myriad places it can be set? Just throwing out some basics that come to mind first. I have noticed in the past that Chrome/Firefox/IE/Edge will use different stuff sometimes, but that tends to mostly be cert stores in my experience, so I'm not sure if that applies in this case. Just confirming: are there zero additional things (no addons of any sort) between the base install of the browser and your test? After trying a million things - disable hardware acceleration and the Microsoft compatibility troubleshooter have helped significantly - thankyou. No. Fresh install, no sync with previous installations. Comparable utilization, about 30% CPU and no change in memory utilization. No. All browser caches are symlinked to the RAMDisk, and %temp% is moved to RAMDisk as well. 100% fresh install of all browsers, no addons/sync/flags changed. What download speeds are you getting in Chrome with something other than a speedtest, like AMD drivers for example? About 500Mbit, which is in line with the upper limit I've seen from the speed tests on Chrome. In general, I've found the Google Fiber speed test to be very erratic. Looking around online IE11 consistently beats chrome in gigabit speed tests. Fascinating problem but it does not appear to be isolated to your PC. For my own fun, can you try in and out of incognito mode? Are the results the same across all devices or is it just the HTPC that is experiencing the anomalies? I don't have any actual suggestions for a solution, purely my own curiosity at this point. HTPC is the only wired device to test with. I doubt the device is to blame given that 2:3 browsers work fine, though. Just to throw something out there, have you tried the different versions of Chrome? Beta, Canary and Chromium. How about Opera, which uses the same engine? Beta and Stable produce same results. Will try Opera tonight. I suspect this is not a rendering engine problem, rather a "we limit the number of simultaneous connections" problem inherent to Chromium. There seems a bit of irony in it all. They are introducing a lot of fiber and competition for Gb Internet, yet their browser can't hang. Another though. Are you connected to a work VPN? Although, probably moot point since it doesn't affect other browsers. As a test of theory, while you are at work/in office do you have access to a web based download that stays on the internal network? (which may only be 10/100 so this test may also be moot) Thus you could test the download rate from a resource internally over chrome vs out on the internet? I can connect to a work VPN, though the security protocols in effect on a VPN pipe are a kick in the teeth to throughput. You'd be pretty lucky to get 500Mbps WAN-to-LAN on VPN without spending an exorbitant amount on multi-core routing appliances with AES-NI or Intel QAT. 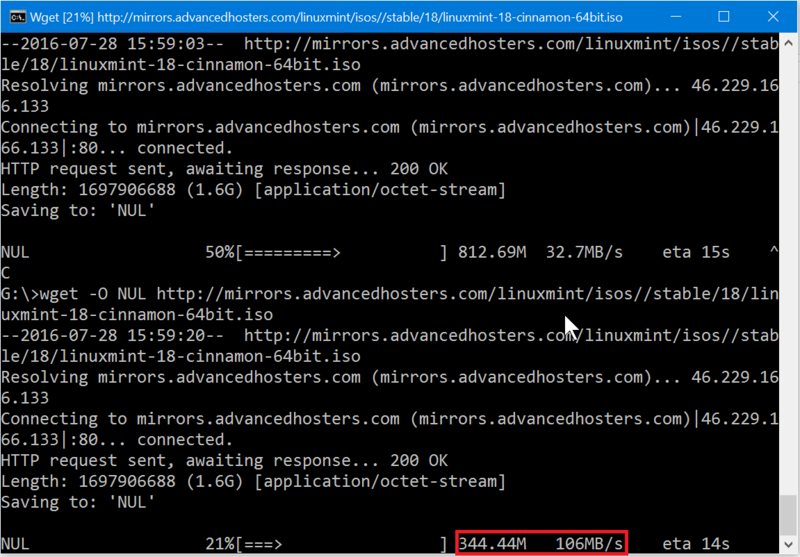 That said, I'm going to find a host capable of serving me a large file at 1Gbps to see if HTTP transfers are faster. I might be able to arrange a large "download" from within the LAN, too. My comment about VPN was thinking that maybe they were throttling you, but then I talked myself right out of that one because it would affect all browsers. I should have deleted the VPN section. Any update to this @Thrax? I now have whole-house wired gigabit LAN and WAN and have been able to test other Chrome installs on other PCs. Only the HTPC's installation of Chrome suffers this bizarre bandwidth deficiency. I've reinstalled Chrome many times on this PC, and have manually scrubbed all traces of it from the registry and otherwise, but the issue persists through installs. It's also not an addon problem, because even a clean install of Chrome on the HTPC manifests this issue. A step down the road, but maybe not a step down one with an answer. Investigation continues. I'm going to say that it's just one of those weird hardware quirks that only will manifest with Chrome on that PC. Have you tried a different NIC?